A member of the Maysville Rotary Club since 2000, Nancy is a Sustaining Member, Paul Harris Fellow, and Paul Harris Society Charter Member and a Benefactor. She was instrumental in establishing a library at St. Anthony’s School in India as a project for her club. She gained partnerships from two Districts in India to provide $80,000 to feed hungry children in NC District 7730. She has helped clubs in many districts partner with host clubs in countries around the world. 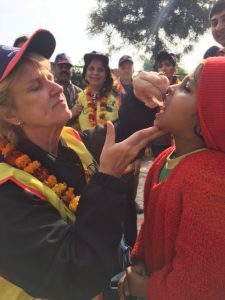 Global Grants in the following areas have resulted in these continued partnerships in India and Ghana: heart surgeries, eye surgeries, literacy, vocational training centers for women, water and sanitation projects, micro-flush toilets, micro credit loans, orphanages, and medical missions.